In January 2018, WendyVitter was nominated by Donald Trump to a seat on the United States District Court for the Eastern District of Louisiana. Last week, Ms. Vitter was questioned by members of the Senate Judiciary Committee. What follows is a nonverbal analysis of a controversial portion of that exchange. The time markers and dialog are referencing those contained within the video above. RICHARD BLUMENTHAL (beginning at 0:30): Do you believe that "Brown versus Board of Education' was correctly decided? WENDY VITTER: Ω Senator - [suttering] I don't mean to be coy, but I think I get into a, ah, difficult, [stammering] a different - difficult area when I start commenting on Supreme Court decisions which are correctly decided and which I may disagree with. Again, my personal, political, or religious views I would set aside. That is Supreme Court precedent. It is binding. If I're [stammering] were honored to be confirmed, I would be bound by it, and of course I would uphold it. RICHARD BLUMENTHAL: Do you believe it was correctly decided? There were many different types of nonverbal displays in this short video, however, one in particular is examined here. 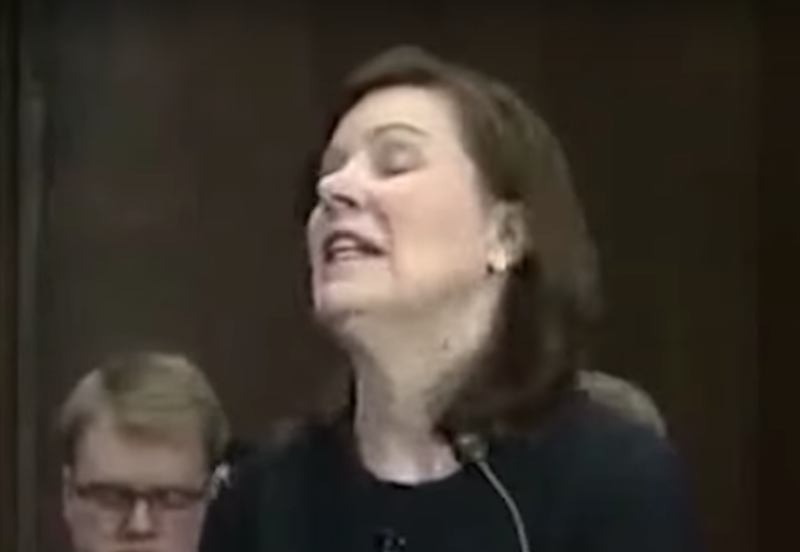 At multiple times during her dialog with Senator Blumenthal, Ms. Vetter displayed what is known as a Self-Righteous Head Wiggle. A Self-Righteous Head Wiggle (SRHW) is a classic nonverbal display - characterized by a side-to-side movement of the head and neck. Usually, the movement is fairly rapid (high frequency) and of varying amplitude. Sometimes, it's extremely short in duration (almost a microexpression) and at other times it lasts longer. Because this is a dynamic display - the viewer is strongly encouraged to watch the video, as the still images do not capture the motion and nuance of this nonverbal behavior. The Self-Righteous Head Wiggle is typically displayed by individuals who are of relatively high-alpha personalities - but during moments of extra-high confidence and when they're expressing particularly strong opinions. The SRHW can be thought of as a form of nonverbal swagger and often nonverbal arrogance. • 0:52 - 0:53, as Ms. Vitter says, "... and which I may disagree with ..."
• 1:19 - 1:20, as she says, "... my bosses' ..."
• 0:36, notated by the Ω symbol, just prior to saying, "... Senator ..."
• 1:15, notated by the ∆ symbol, just after she says, "... respectfully ... "
• 1:29, as she says, " ... this case ..."
• 1:22 - 1:23, as she says, "... the Supreme Court ..."
• 1:31 - 1:33, when she says, "... I think we get into a slippery slope ..."
Another common feature of the SRHW is a temporary increase in pitch (vocal frequency), volume, as well as speaking speed (e.g., words per second). This paralanguage/verbal language dynamic is simultaneous (or nearly so) the SRHW. A good example is seen here during 0:52 - 0:53, as Ms. Vitter says, "... and which I may disagree with ...". Sometimes, there is often displayed a similar motion of the torso (as is seen to a mild degree in a few of these examples) or even the jaw. 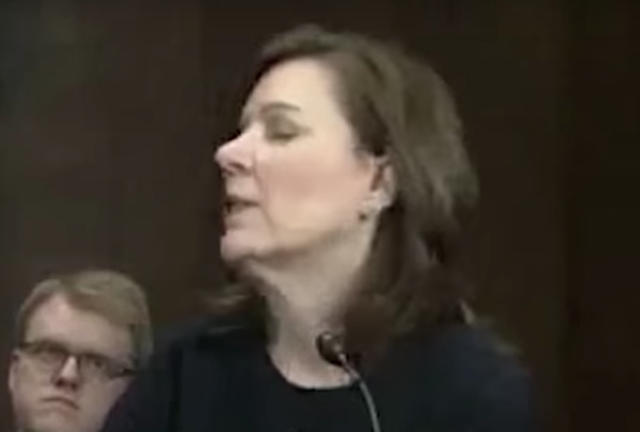 You'll note that Ms. Vitter also closes her eyes during some of these SRHWs. In this context, this prolonged eyelid closure acts as an amplifier of her self-righteousness, contempt, and disgust. Summary: Wendy Vitter is a nominee for U.S. District Court Judge for the Eastern District of Louisiana. Her nonverbal and paralanguage behavior in this hearing - indicates that she does NOT believe the 1954 Supreme Court ruling, Brown v. Board of Education was correctly decided.